One of our favourite go to meals in our house are Chicken Fajitas. Not only are the quick and easy to make but they are delightfully low in points and bursting with flavour. This week, after having my regular craving for Fajitas but having no wraps or salsa in the house, I decided to turn our favourite dish into a pasta dish. My OH loved this one. The flavours or the spices burst through whilst the sour cream mellows the whole dish out a little. The sprinkling of fresh avocado on top adds a lovely freshness too! Fill the kettle and pop on to boil. Take a large non stick sauce pan, pop on a medium heat, spray with 1kal and add the chicken. Season with salt and pepper and fry for 5-7 minutes until cooked through. Add the garlic, peppers and onions along with all the powdered spices and fry for another 3-4 minutes until the onion starts to soften. Stir in the tomato puree, fry for another minute and make up the chicken stock and add to the pan. Pour the dried pasta directly to the saucepan, making sure the water covers it and simmer on a medium/high heat for 11-13 minute until the pasta is al dente. Turn the heat up to high to simmer off any excess water and then add the sour cream and stir through. Simmer for another minute. The sauce should have thickened nicely by now and absorbed into the pasta a little. Remove from the heat and stir through the fresh coriander and juice of ½ lemon. Serve into bowls and top with the chopped avocado, a sprinkle of coriander and a few slices of chilli. Is it 2 tsp each of chilli, cumin n paprika? So pleased you enjoyed it Katie! Yep, one for all the family. Delicious! Hi Laura – looks like a fab recipe – thank you! I’m planning on cooking it this week! Just to check, does the pasta go into the same saucepan as the chicken and the stock? I love love love this dish, my husband and I have had this at least 3 times in the last 6 weeks! Thank you for your blog. I’m a WW coach and all my members love it as well, it always gives us great ideas and tips. Don’t ever stop! 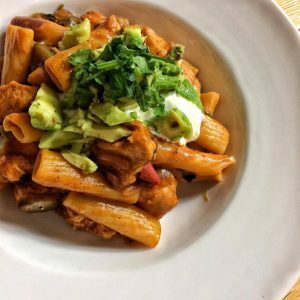 does the pasta not need to be boiled/cooked first? Or does it just get added to the chicken straight from the packet? Made this today Laura, it was amazing, so tasty! Made this tonight, absolutely gorgeous. Thanks for the great recipes Laura, can’t wait to try more. Hasn’t made this for tea tonight absolutely delicious! made this for tea tonight absolutely delicious! This si the sexond time i have made this dish and it is lovely. I have had to tone down the chillies etc, too much for me and substituted the sour cream with yogurt.